So after the buzz and excitement of finishing the scrappy trips quilt, I was itching to get started on a new quilt project. I decided upon this chevron idea, as I love HST and can't seem to get enough of them! This particular quilt is intended for my mum's 50th birthday in a few days :) so I used a variety of fabrics from my stash that I thought would be 'mum' taste, in a pinky/red colour palette. I love how it's coming together! I'm planning a pink stripe binding, not sure about the backing fabric yet? I hope you are all having a good start to the week? What are your creative plans? Another great quilt beginning! Love it. This quilt is so pretty too!! I love it!! 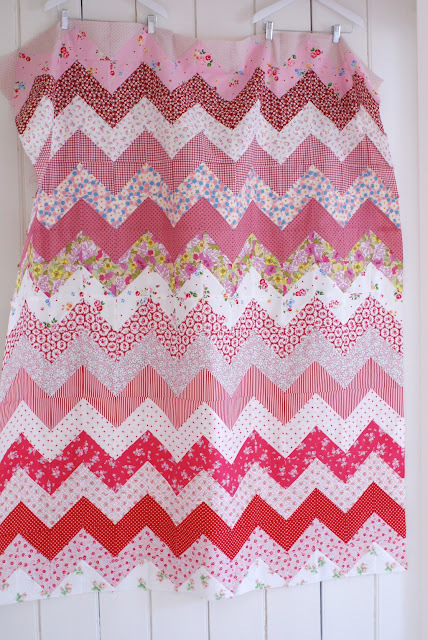 such a pretty zig zag quilt!! This is sooooo lovely. Your Mum's gonna love it! You have been a busy bee!! Love the quilt...this week my plans are to finish my tea towel set. 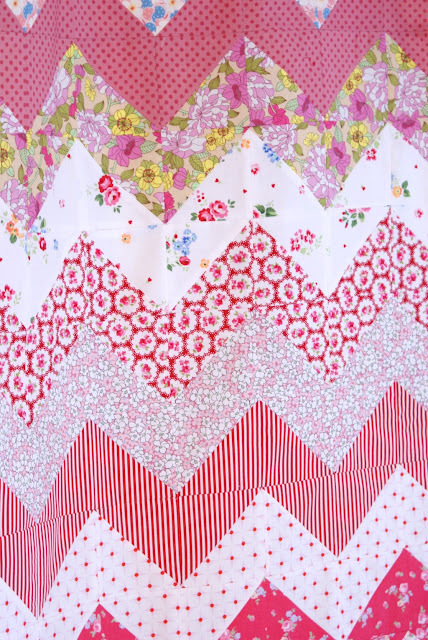 Such a pretty quilt top! I love pink! And with white it is so fresh! Happy birthday- to your Mum, who will love this! We must have very similar tastes, coz I love this quilt too! As well as your scrappy trip along. I want to make a zig zag quilt. I have a jelly roll of Cuzco to use. I am loving your zigzags! I am planning on one of my own! I think a zigzag, twice as tall as those on the front and maybe 1/3 of the total width of quilt long, deliberately off-set would make a very interesting quilt back.